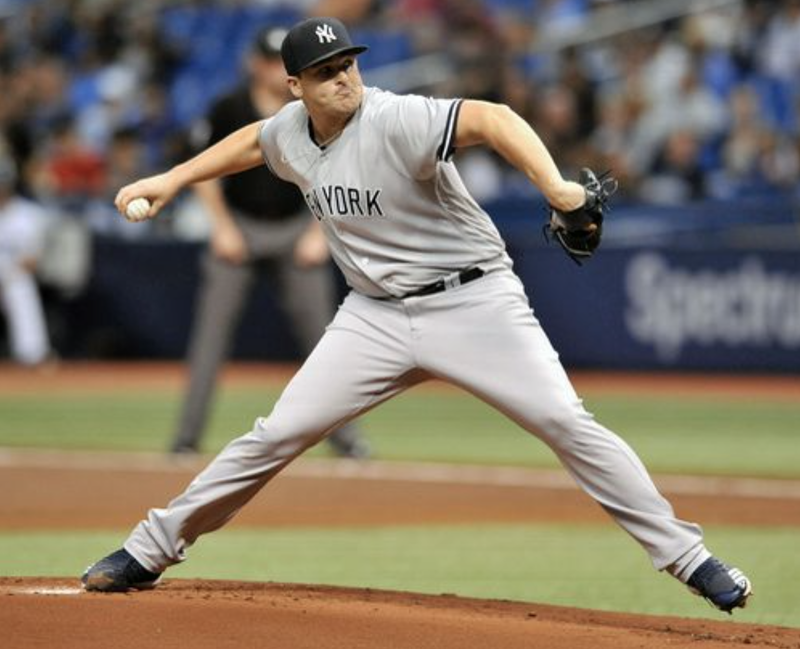 Entering the last week of the regular season the Yankees opened a four-game set Monday night in the always dreaded trip to face the Tampa Bay Rays. The Yankees came into tonight sitting one and a half games (two in the loss column) above the Oakland A’s for home field advantage in the AL Wild Card game. Aaron Boone decided to go with a “bullpen day” tonight instead of giving the ball to a typical starter. Jonathan Holder started the game and had seven other Yankee pitchers follow him. In a great group effort, the Yankees only allowed one run, winning game one of this series 4-1. Holder handled the bottom of the first, allowing two baserunners but ultimately no runs. Stephen Tarpley came on to pitch a perfect second inning throwing just 10 pitches. The rookie has given up three runs in five IP this season, but has a wipeout slider that is big league ready. The Yankees started the scoring in the top of the third when Andrew McCutchen launched a bullet down the left field line that got over the wall. It was a solo shot. Sonny Gray pitched a clean bottom of the third and was sent back out for the fourth when Tommy Pham got the first hit for the Rays with a leadoff double to left. Another passed ball by Gary Sanchez allowed him to reach third where he eventually crossed the plate on a fielders choice tying the game at one. However, the game was only tied for mere minutes before the Yanks put two more runs on the board in the fifth. A two-out rally started by a leadoff walk from Aaron Judge was followed up with a single from Brett Gardner and a double from Giancarlo Stanton. The Yankee bats were relatively quiet for the rest of the night besides back to back doubles in the seventh off the bats of McCutchen and Judge. This plated one run. The bottom of the sixth inning was testy for Yankee pitcher David Robertson. Two walks and a fielder’s choice to start the inning had runners on first and third with just one out. Robertson struck out the next batter, but Brandon Lowe crushed a two-out pitch to dead center field. 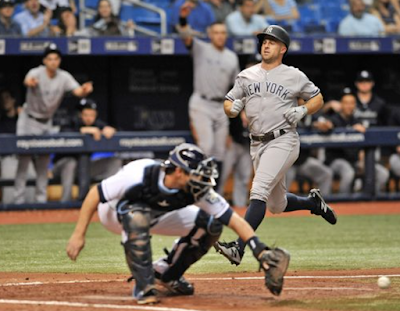 Luckily Brett Gardner had his pitchers back as he made a spectacular play crashing into the wall and saving two runs. It was all smooth sailing from there as the Yankees went Chapman/Betnaces/Britton to end the game. They combined to allow no hits and one walk while striking out five showing how dominate the backend of this pen can be. The Yankee offense was by no means great tonight, but timely hitting paired with a great pitching performance by eight different guys helped the Yankees secure a big win over the Rays. Note: Aaron Hicks left tonights game in the fourth inning after coming up gimpy beating out a double play ball. It is a hamstring issue but the severity is unknown. Brett Gardner replaced him. What’s Next? The Yankees continue their four-game series against the Rays with a 7:00 EST first pitch tomorrow night on ESPN. Luis Severino will take the mound for the Yankees in what will most likely be his last start of the 2018 regular season. The Rays have not yet announced their starter, and could very well be going with a bullpen day.